The Czech new media art scene could be characterized by a latecomer strategy which in recent years is turning its disadvantages into a source of advantage. As video art and other trends from the 1980s and 1990s were never strong in the Czech art academies, young artists feel free to experiment and often develop very promiscuous relations to different traditions, trends and technologies. The exhibition presents projects from recent years that demonstrate this playful and experimental strategy which is neither purely political nor technological. It is cosmopolitical in a sense that it tests the limits of our common world which we share with both machines and nature. It examines different networks between nature, society and technology; but also between our history, present and possible futures. It presents challenging views of different hybrid collectives of humans and machines. It interconnects globalization as well as evolutionary and technological processes to examine different versions and views of our common world; but also the possibilities of contemporary art. The exhibition presents works by Josef Bare, Internet Generation, Jakub Nepra, Jan Pfeiffer, Pavel Sterec and Pavel Tichon. show art as an exploration of collectives of human and machines and the limits between physis and techné. 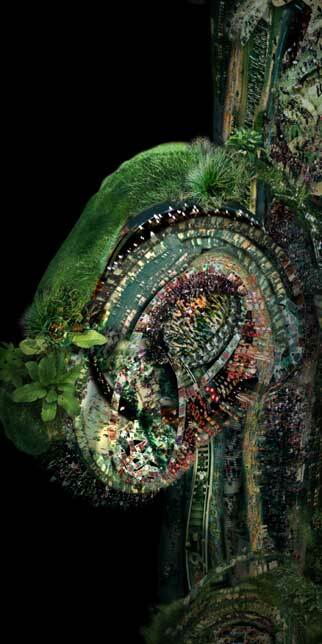 Pavel Sterec work Symbiont, 2007, presents a tree with prosthesis and a new apple of paradise which presents the intimate and balanced relationship between the artificial and the natural. 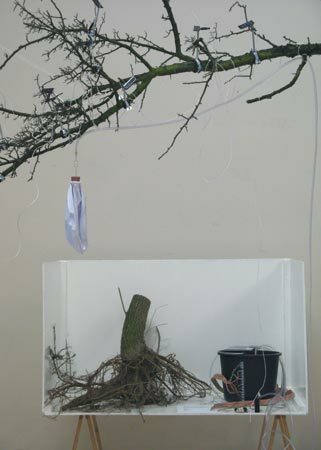 An autonomous biorobotic plant climbing up a living tree consists of a water collector in place of a tuber, solar panels instead of leaves, rubber tubes and an artificial fruit. Inside the fruit there is nutritive soil in which microorganisms reproduce. After gradual "ripening" the "fruit" is released due to excessive pressure. It falls down, where it fertilises the host tree. A "seed", which is actually an SD card is placed inside the fruit. All the data necessary for the breeding of a new symbiont is put into the card. A microcontroller guarantees the accuracy of the growth process and is in control of the whole procedure. Symbiont offers nutrients, which promote the growth of the host plant, in exchange for better access to light (i.e. Solar panels in the treetop). In his works Generator-P730 and Cultures, both 2005, Jakup Nepra questions subjects like the urban reality and environmental problems. In the video a common circuit board has been transformed into a media microcosm: the everyday life of a town with its inhabitants takes place between connections, cables, and hard disks. The boundaries between real and edited images are technically so perfectly blurred, that it takes a few moments, until the illusion of the work reveals itself to the spectator. 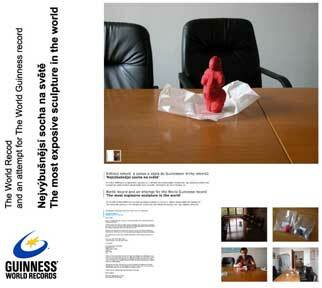 understand art as exploration of new distribution channels and popular media: world records, torrents etc. In his video Xiaozhu, 2006, Josef Bare gives an instruction on how to survive on the global market as an artist while competing with cheap pirate copies. While others sell Chinese art to make money, there is always someone who will try the more challenging thing and sell art to the Chinese. The screening includes a selection of animations from the hawked DVD. show art as exploration of technology, time and politics. In his work Short Cuts, 2006, Jan Pfeiffer uses Google map as the camera to the past, video as a means to understand our present, politics and art. The group Internet Generation tells us: "Artwork is a file! Everything is a FILE! DIGITIZE everything that is analogue! SHARE all that is digital! PROGRAM and develop new software for files!" Art Laboratory Berlin / Cosmopolitics from thekarte.org on Vimeo.